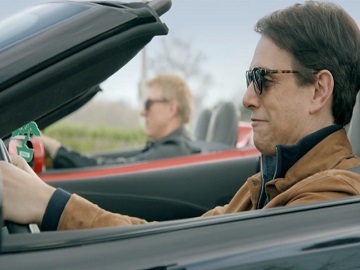 Enterprise invites you to see, in one of its latest ads, what happens when Cobra Kai stars Ralph Macchio and William Zabka take their rivalry to Enterprise. The car rental company also encourages people to watch Cobra Kai on YouTube, informing that all episodes will be available on April 24th. The 30-second spot, entitled “Team Miyagi-Do vs. Team Cobra Kai,” features Macchio and Zabka taking jabs at each other in an Enterprise branch, while trying to ask for specific cars. Macchio, for instance, shows up and intervenes in Zabka’s conversation with the Enterprise agent, advising the latter to give Zabka something with a deck tape because no way he is going to figure out Bluetooth. Zabka doesn’t hesitate to tease his fellow, asking the Enterprise agent if she got something with a booster seat for Mr. Macchio. They are both informed that Enterprise can provide cars of all kinds for rent, purchase or sharing and takes them outside, to show them some of the vehicles, proving that, indeed, Enterprise, can meet all their requests. The end of the commercial sees the two actors leaving at the wheel of convertible sports cars and an onscreen line informing that all episodes of YouTube original series Cobra Kai will be available on April 24. Macchio and Zabka have thus joined the likes of Martin Brodeur and Kristen Bell, who have starred in Enterprise commercials over the years.